Another awesome new hair release from Adoness available until July the 16th at event location, and their mainstore afterwards ! Scroll down for a closeup of the gorgeous braid detail, complete with a gemstone pin. 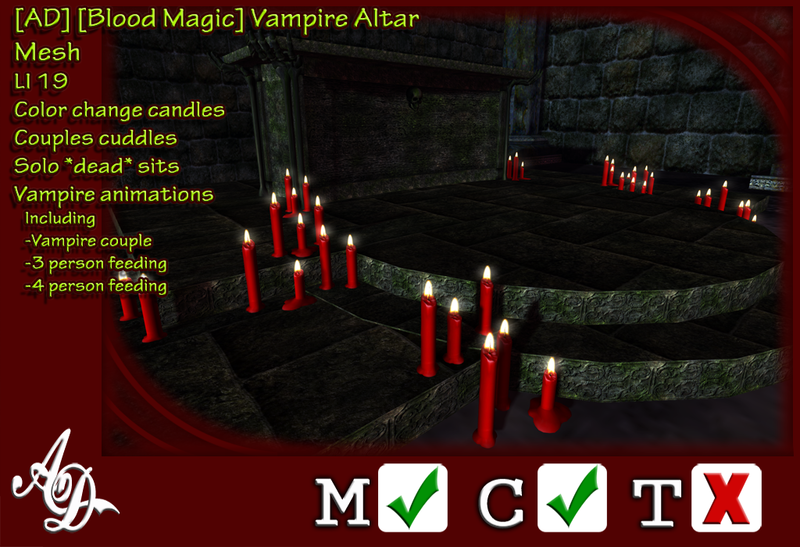 Metal and stone color hud included with each color pack. Eyes: [QE] Summoner Eyes @ The Darkness Chamber Fair - includes a total of 6 wickedly gorgeous eye colors,with clean or bloody sclera, each applicable individually on left or right eye. Eye makeup: .:MMC:. Morgana Eyeshadow @ Darkness Monthly - dollarbie gift available at the current round, includes 5 styles, mesh and system head compatible. Tats: TSO-Runes Tattoo @ The Darkness Chamber Fair - Perfect for that witchy look ! Mesh body compatible. Skirt & Top: [[BR]] ARADIA outfit @ The Darkness Chamber Fair - Fitted for Maitreya,Slink and Belezza, top and skirt can be worn separate as well, allowing you to mix up your look easy. Mask: ::Axix:: Laverne Mask [Onix] @ We <3 RP - both left and right masks included, wearable together or individually. All furnishing used in this photo is from my own store, . ::[Angelic Designs]::. The Darkness Chamber Fair is open, and you can pick up some awesome stuff to please your inner...and outer demons alike ! Since last time did not show you the tat from Beauty of Darkness, I will now, alongside with some jewelry you need to own ! Choker: !TLB - Witchy Choker w/ HUD @ The Darkness Chamber Fair - Texture change, making it an easy fit to any outfit really. Tongue piercing: [CX] Tongue Barbells (Bento) @ CerberusXing - Group gift !!! 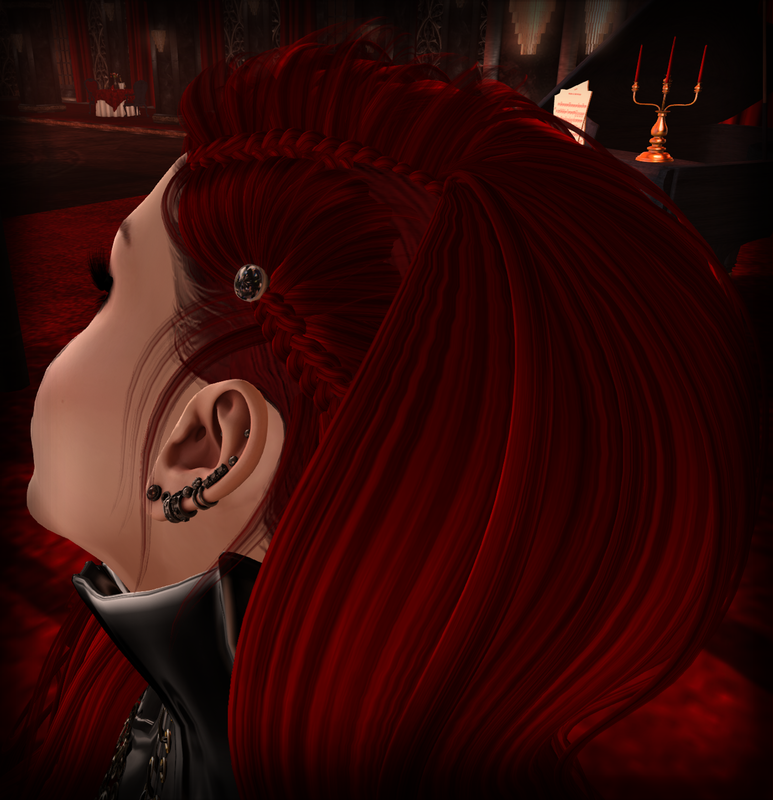 Hair: adoness : doris @ Hair Fair 2017 - Wearing the scarlet from the red pack in this photo. Now, let me tell you WHY I am such a huge fan of Adoness hairs ! Not only they are edgy and awesome, but, they are left modify, so if you are looking to tint to get just the right shade, you can ! Nailpolish: DP - Koffin Nails - Black Magic @ The Darkness Chamber Fair - Includes a total of 10 colors, for finger and toe polish alike. 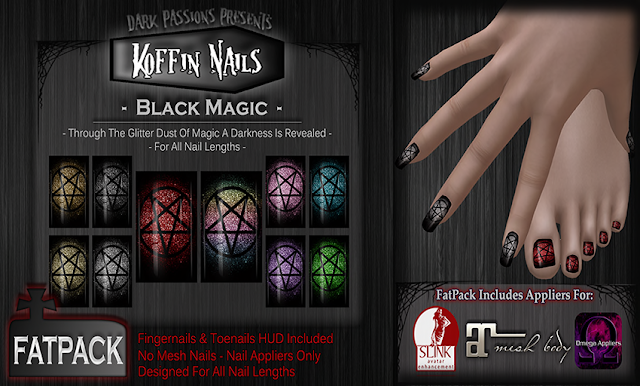 Scroll down for the full palette of this witchy goodness ! You can pick up all 3 pieces at the fair separate, or as a full pack, including not just the clothes, but a tat as well, at a generously discounted price! If you scroll all the way down, will show you the promo for this awesome deal ! Body chain: [MaGmA] - Chain snake - Viper (black) RARE - Picked this up at a previous round of Epiphany if I am not mistaken... cannot seem to find an inworld store location for this creator though, unsure if you can still find their gachas some place, sorry ! [AD] [Blood Magic] Vampire Altar @ The Darkness Chamber Fair - Available both in PG and Adult versions, at a 75% discount for the duration.